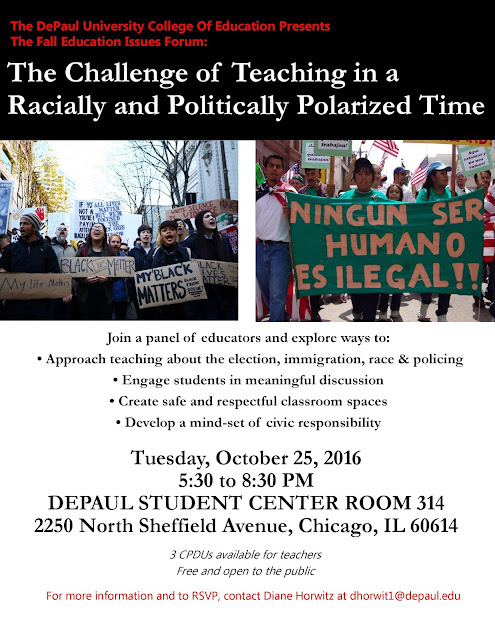 Missed the 2016 Teaching for Social Justice Curriculum Fair? You can check out Mariame Kaba's talk here. We Are All Oaxaca! Todos Somos Oaxaca! - Online Fund Raiser! The Mexican government continues to repress public school educators on strike to demand respect for human and labor rights. Many teachers and students have been killed in the most recent round of violence by the government. 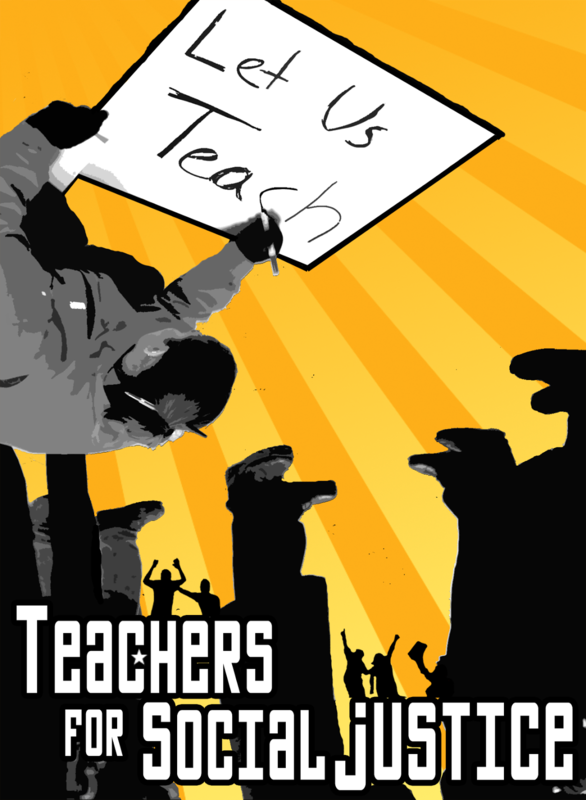 Help raise money for the left teacher union leadership, the CNTE (Coordinadora Nacional de Trabajadores de la Educación), to hold assemblies, legal defense and fight back against the assault on their members. This is the solidarity they need right now. This year's Curriculum Fair theme: DEFUND Police in Schools and Communities: FUND Community Schools and Communities will explore the connections between racial and economic justice, the links between racism and capitalism, and state sanctioned violence in communities and schools. As educators, parents, and communities members, we know the troubling relationship Black and Brown families often have with police, yet police have become a common fixture in our schools and in our communities. We refuse to accept this as a norm. Our children deserve to be educated not policed. 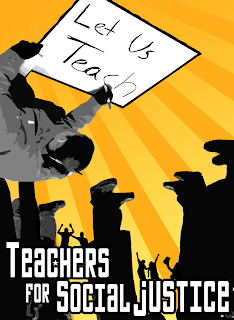 -What does it look like to strive to be an anti-racist teacher practitioner? 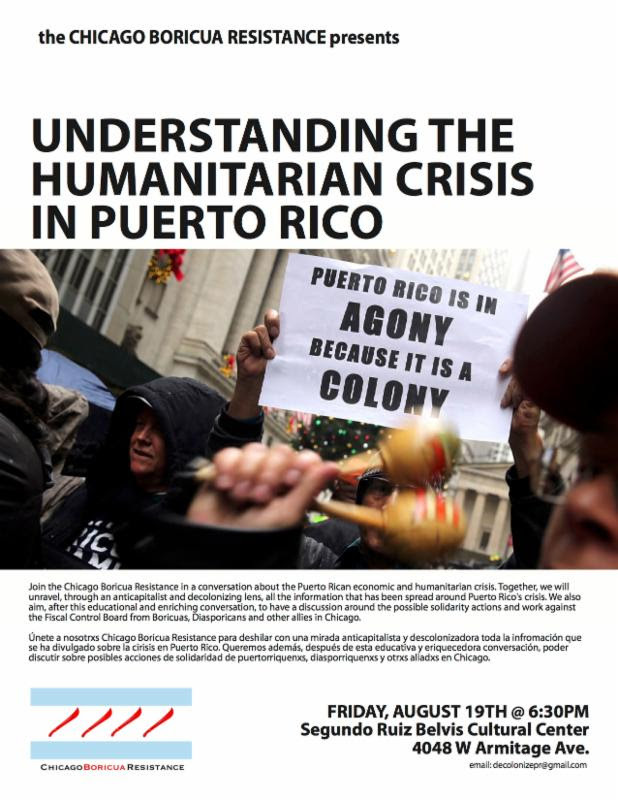 -How do we understand the political economy of, and the connection between, chattel slavery, the prison industrial complex, and over-policing in Black and Brown communities? -What are the historic and contemporary issues that contribute to the explosion in incarceration and policing in Black and Brown communities? -What are the radical possibilities for truly restorative justice in our schools and in the communities in which they are situated? 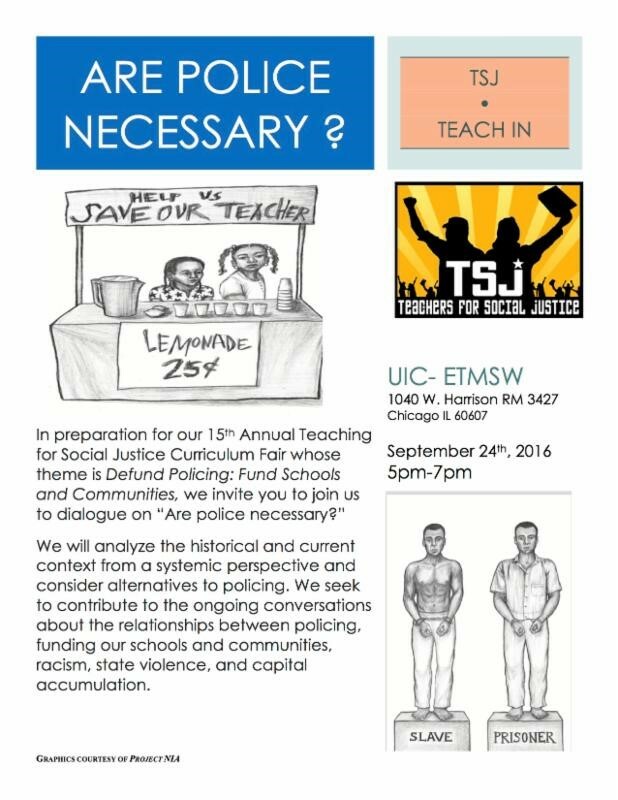 Join us to discuss and plan the theme for the 2016 Teachers for Social Justice Curriculum Fair #TSJCF16, and begin to plan together to make this the most meaningful and action inspiring TSJ Curriculum Fair yet. Join TSJ for the April 1 #ShutDownChi Day of Action! RSVP Here to get text action alerts! April 1 in Chicago will be a day of mass action against austerity politics, racist violence, anti-immigrant and Islamaphobic attacks, the savaging of human needs in Illinois, growing poverty, attempts to smash unions, and economic violence against the vast majority of people in our state. And, it will be a day FOR justice, fair distribution of wealth, progressive revenue solutions, full funding of our schools and human needs, and racial and social justice. Click on a star to see what events you can plug into. 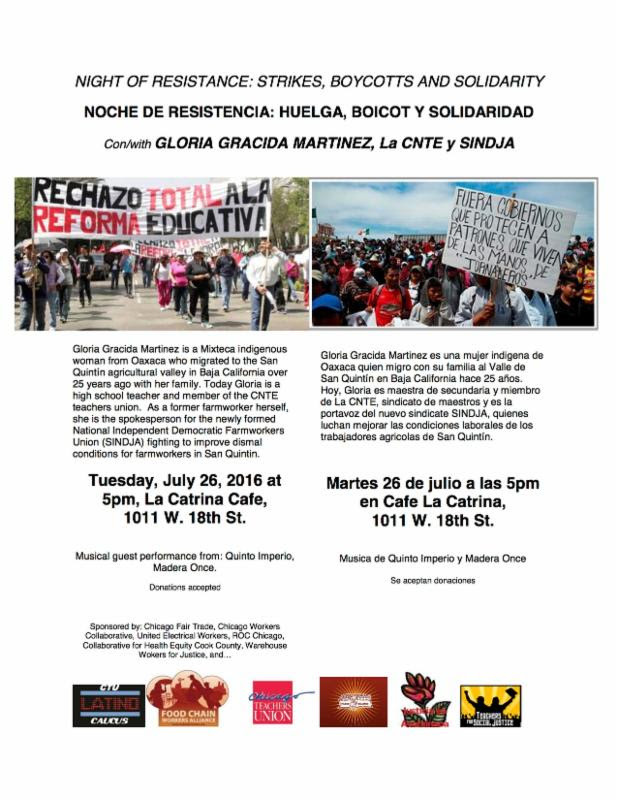 Join families, students, teachers, workers, and all those who thirst for justice. More than 100,000 workers in the state of Illinois are out of a contract and are bargaining directly with our adversaries—Governor Bruce Rauner, Mayor Rahm Emanuel, bankers and billionaires like Ken Griffin, who are calling for school closings, university closings, budget cuts, lower wages for workers and restrictions on collective bargaining. Racial injustice fuels the prison industrial complex by sending poor Black and brown men and women to prison each day. Chronic disinvestment has caused poverty in the state to grow considerably. 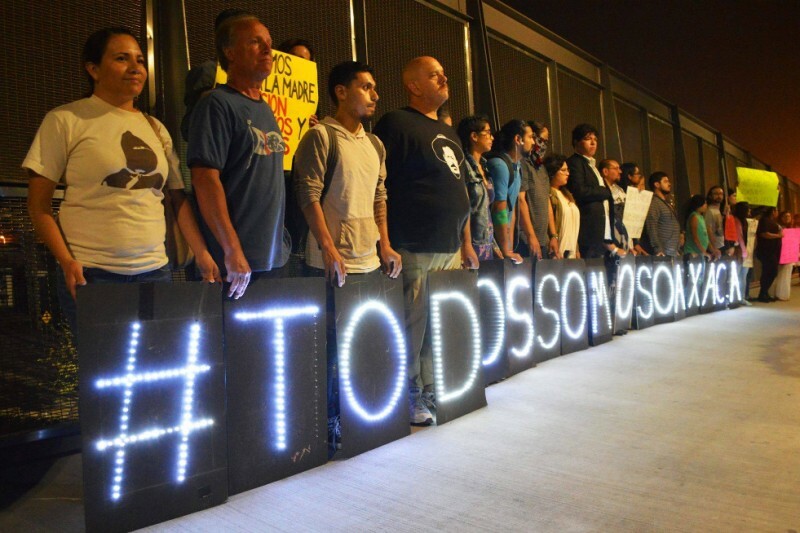 Law enforcement agencies are under federal scrutiny for the murder of unarmed people and the mentally ill. Child-care workers and low-income parents are under attack. Yet multimillion-dollar arenas, museums and millionaire condos are being built all around us. Tax cuts for those with the highest incomes, an unfair, regressive flat-tax system, and corporate loopholes galore have put Illinois in this fiscal distress. In Chicago, the mayor refuses to renegotiate bad deals with the banks profiting off of our “broke on purpose” schools. The mayor's TIF program siphons money from schools, parks, libraries and other public needs and hands it to wealthy developers. Rahm's handpicked board of education wastes millions on excessive testing and mismanagement while they cut and cut from school budgets. Enough is enough! 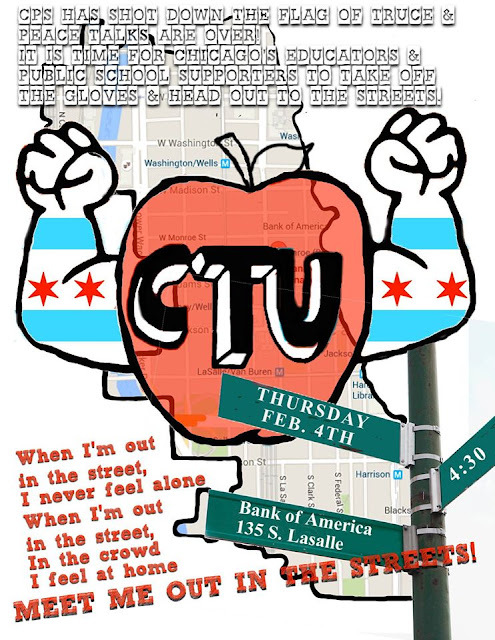 April 1 in Chicago will be a day of mass action against austerity politics, racist violence, anti-immigrant and Islamaphobic attacks, the savaging of human needs in Illinois, growing poverty, attempts to smash unions, and economic violence against the vast majority of people in our state. And, it will be a day FOR justice, redistribution of wealth, progressive revenue solutions, full funding of our schools and human needs, and racial and social justice. 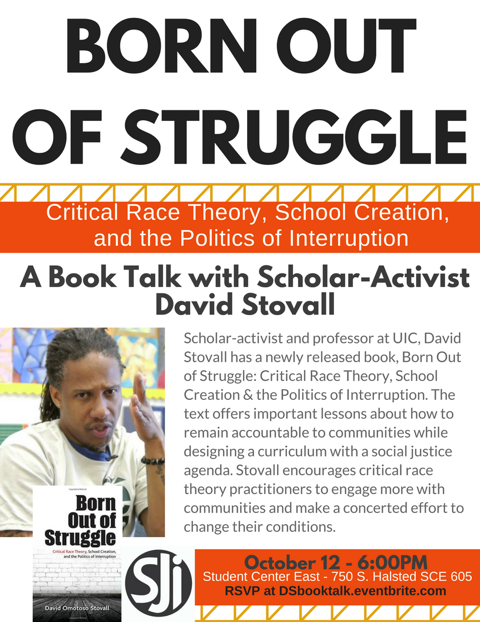 This Teach-In will address WHY Teachers for Social Justice and so many others in Chicago, from labor (e.g., CTU), education justice organizations, racial justice groups (e.g., Black Youth Project-100), community organizations (e.g., Kenwood Oakland Community Organization), economic justice groups (e.g., Fight for 15), religious progressives (e.g., ARISE-Chicago), and many others are coming together April 1 to #ShutDownChi! 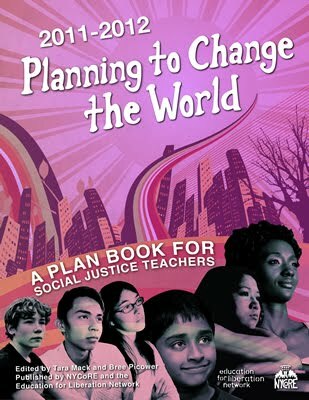 What are the connections between all these issues and movements and how does April 1 relate to our larger efforts to create a new world that is possible and necessary? How can you help organize in your workplace/community/school to build for April 1 and make this an historic day in Chicago as we fight for a better future? Come to the Teach-In to discuss and learn about these issues and their interconnections, and to help plan and organize for April 1. For more info, email here.